I’m positive we are all familiar with the story of Paul Revere and his wild ride throughout parts of Boston during the Revolutionary War. Traveling on horseback throughout the night, Revere set out to alert fellow Patriots Samuel Adams and John Hancock of the British plan to have them arrested. However, Revere did not act alone. 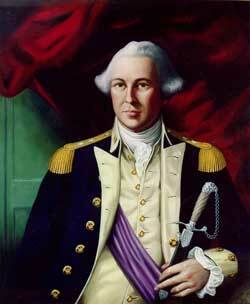 The man who sent Revere on his now famous journey that night was none other than Joseph Warren. Who? I get it. Joseph Warren is definitely not the most recognizable name on the founder’s list. Admittedly, I myself also did not who Warren was before researching him for this project. Despite this, it is important we recognize Warren. Despite the fact that his name may not immediately ring out to some, he too played a role in the colonies fight for independence against the British. A graduate of Harvard, Warren was a physician (caring for both free and enslaved men), scholar, writer, as well as a Patriot. He died in the Battle of Bunker Hill on June 17th, 1775 at the age of 34, where he declined rank and instead elected to fight as an individual. Having just been appointed Major General a few days prior (in addition to serving as the Chief Executive of the Revolutionary Massachusetts Government), Warren’s death was indeed a big blow to the Patriots. Many historians simply describe Warren as a hero for his contributions and impact on the Revolutionary War, and also believe that had his life not been cut short during battle, Warren would have went on to accomplish even more extraordinary and noble feats. Although Warren was successful in rallying many slaves to join the fight for freedom and independence against the Loyalists, he ironically was a slave owner himself. In one document specifically, it is reported that Warren purchased a young, African American enslaved boy from a man named Joshua Green. Interestingly enough, Green went on to become the landlord of one of Warren’s properties in 1770, and it is suspected that the transaction between Warren and Green had something to do with Green ultimately holding this position. Perhaps Green was granted the title of landlord as a favor, or in return for selling the enslaved individual to Warren. Or, maybe Warren was short on the amount required to purchase the boy, and therefore accommodated Green with the position as payment instead. However, because there is no official documentation of the enslaved individual’s identification, one can never know for sure. With limited information available regarding Warren’s views on slavery, it may be worthy of further exploring his role as a physician. As stated, Warren provided care for both free and enslaved, high and low class, and American and English individuals as a physician. While only a small piece of evidence, I believe this indicates his ultimate view of all men being created equal and deserving of equal treatment. If one did not value the livelihood of someone enslaved, and instead was of the mindset that if one becomes ill they can be replaced, why would they spend their time nursing them back to health? They wouldn’t, and that is why I am of the belief that Warren’s impartialness and open mindedness when it came to his occupation truly reflects his outlook on equality among all men. Collectively, the Colonists viewed themselves as being enslaved under the rule of the Loyalists. Speaking out on several occasions, Warren was very vocal in his stance on being under British rule, but never took a public stance on the topic of slavery in terms of the buying and selling of African Americans. In his “A Letter of Correspondence with the other Towns”; Warren discusses his belief that the right to freedom is the gift of God Almighty, and no man has the right or power to alienate this gift. With as little information available on Warren’s take on slavery, I feel this is important to mention because it creates one completely big contradiction. Prominent Patriots like Warren and Thomas Jefferson desired independence, yet they owned slaves, which in turned denied the freedom and independence of others. “30 Pounds and Pottery for a Slave.” Doctor Joseph Warren RSS. Accessed March 6, 2015. http://www.drjosephwarren.com/2012/03/30-pounds-and-pottery-for-a-slave/. United States. National Park Service. “Doctor Joseph Warren.” National Parks Service. February 27, 2015. Accessed March 6, 2015. http://www.nps.gov/bost/learn/historyculture/warren.htm. Frothingham, Richard. Life and times of Joseph Warren. Boston: Little, Brown & Company, 1865. “The Death of General Warren at the Battle of Bunker’s Hill, 17 June, 1775.” Museum of Fine Arts, Boston. Accessed March 6, 2015. http://www.mfa.org/collections/object/the-death-of-general-warren-at-the-battle-of-bunkers-hill-17-june-1775-34260.